An armed thief who attempted to rob a restaurant, instantly regretted his decision when the workers and customers fought back. CCTV footage caught the moment a man wielding a knife, attempted to rob the Mi Nidito restaurant in Tucson, Arizona, on July 11, 2018. 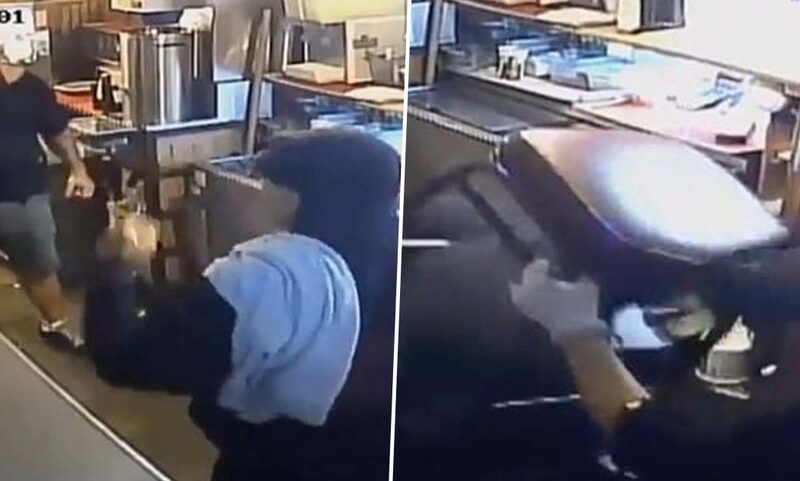 In the video the thief, who was wearing a dark-coloured hoodie, can be seen walking into the Mexican restaurant, strolling over to the counter, while initially hiding his weapon. The man is then seen having a conversation with one of the restaurant’s employees before he walks into the ’employees only’ area of the eatery. Seconds later an employee is seen evacuating customers, who rush out of the door as the thief smashes the cash register onto the floor. However, while trying to pick up the money, he’s hit over the head with a chair by another employee. Other employees, joined by some customers, then run over, attempting to subdue the thief who’s seen throwing punches. They hold him down until, as reported by the Daily Mail, the police arrive arresting him. The news outlet adds, according to officers from the South Tucson Department of Public Safety, two of the employees were stabbed by the man but neither injury was life-threatening. A few days after the incident (July 16), the restaurant’s general manager, Jimmy Lopez, shared a letter he’d written on Mi Nidito’s Facebook page, thanking his employees, as well as the three customers who’d helped. I would like to thank the general public for their well wishes and prayers. Very much appreciated by the staff at Mi Nidito. We would like to thank the Fire department and the Police department of South Tucson for the quick response to the incident. Both departments were efficient and very professional at what they do. Thank you very much. To the three customers who helped subdue the suspect, we also would like to thank them for their help. Thank you very much. My three employees that sustained injuries are doing fine and recuperating well. In the 66 years that we have been in business something like this has never happened. Hopefully, this will not keep the general public from coming to Mi Nidito. We will keep striving to serve good food, friendly service, and to provide a safe environment. Thank you. To: Mi Nidito Costumers, Friends and Family. In the comments section on the post, fans of the restaurant sent the staff their well wishes, praising the team at Mi Nidito. I don’t think anyone will feel unsafe at Mi Niditos, and I, along with my whole family have been loyal customers there since you opened 66 years ago. In fact we used to buy gas there before you opened. Good Luck, Jimmy. I saw the video on YouTube. It was righteous! I live a long way away from Tucson. But the level of loyalty of your patrons and employees in defending what is obviously a GREAT institution was amazing and heartening to see. I don’t think anyone else will try robbing the Mi Nidito restaurant anytime soon!